(i.e. 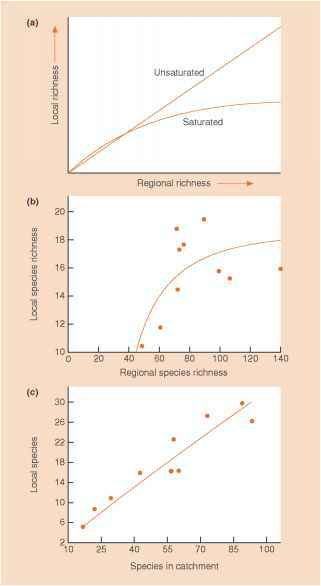 the niche space is fully utilized), local richness will reach an asymptote in its relationship with regional richness (Figure 21.2a). This appears to be the case for the Brazilian ground-dwelling ant communities studied by Soares et al. (2001) (Figure 21.2b). Similar patterns have been described for aquatic and terrestrial plant groups, fish, mammals and parasites, but nonsaturating patterns have just as often been described for a variety of taxa, including fish (Figure 21.2 c), insects, birds, mammals, reptiles, molluscs and corals (reviewed by Srivastava, 1999). Local regional richness plots provide a useful tool for addressing the question of community saturation, but they must be used with caution. For example, Loreau (2000) points out that the nature of the relationship depends on the way that total richness (y) is partitioned between within-community (a) and between-community richness (P), and this is a matter of the scale at which different communities are distinguished from one another. 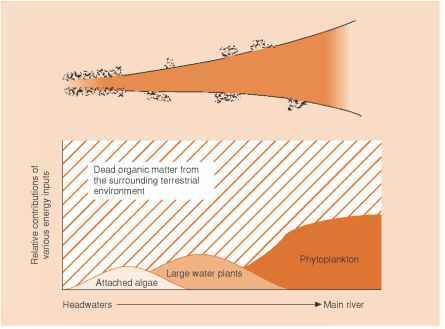 In other words, researchers might erroneously include within a single community several habitats that should be considered as different communities, or, alternatively, local vs regional richness - saturated or unsaturated communities? they may study local communities at an inappropriately small scale (e.g. 1 m2 quadrats may have been too small to be 'local' communities in the ground-dwelling ant study of Soares et al., 2001). What is the relationship between local and regional richness? How to plot local vs regional richness in r?